1. OpenGL gives me graphical glitches on Windows 8 (I have posted some screenshots here). 2. I found the regrowing forest feature quite annoying. It doesn't seem to serve any particular purpose in the context of gameplay (it's not like there's a lack of trees in maps, and even multiple workers have a hard time keeping up with the tree regrowth rate), it isn't particularly realistic, and in maps where building space is limited it outright interferes with playing. I would suggest making this an optional feature like the day/night cycle, and maybe also slow down tree growth rate significantly. Additionally, it doesn't make much sense that the forest would regrow in a completely cleared area. Perhaps tree regrowth should be limited to areas where there is some forest remaining. Any chance the goblins would be redrawn to be larger, with more articulated detail to tell the units apart? 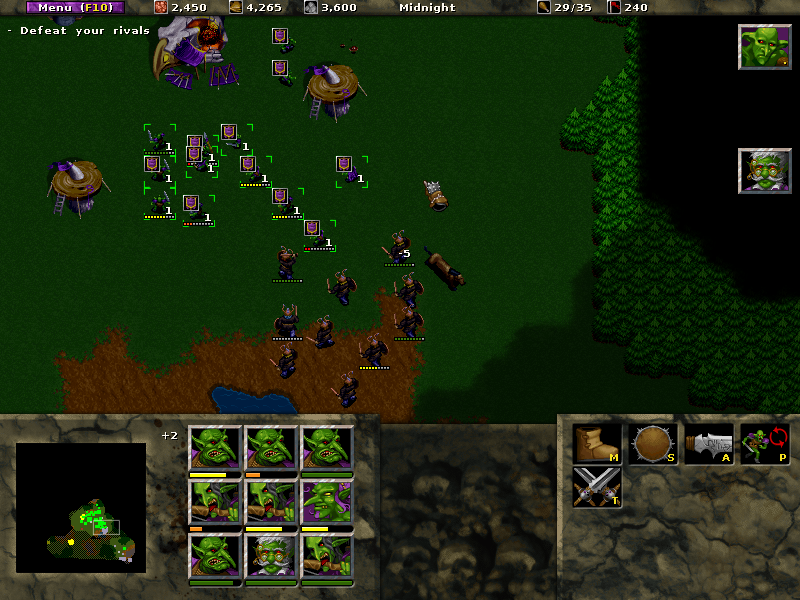 There's no reason why goblins in your game should be as small as the goblins in Warcraft II after all. Also I think that some of the older units in the game, like the dwarven axefighter, could use some facelift as well as they appear a bit less polished than newer units like dwarven guard.